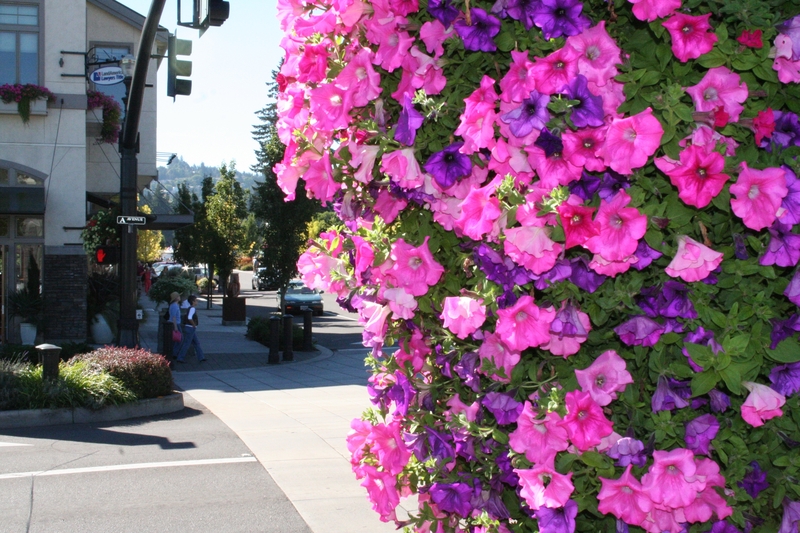 Lake Oswego’s flower baskets provide eye-popping color wherever you go. In summertime, Lake Oswego is in bloom, thanks in large part to the Lake Oswego Village Flower Basket program. Colorful hanging baskets line the main thoroughfares of Lake Oswego and contributed to the city winning the “America in Bloom” award in 2003. What’s the secret behind all that color? WATERING. Sure, it can rain in Oregon on a summer day, but that’s no excuse to take a day off from watering. For the size baskets Lake Oswego hangs, Karsseboom recommends five gallons of water daily. “That’s what’s needed to rehydrate the entire root ball,” he explains. Many gardeners think their container is fully watered when the water starts running out of the bottom of the basket—but that’s just water running along the sides. Stay with it for the full 35 seconds it takes a hose on full blast to soak in the equivalent of five gallons. FERTILIZER. Karsseboom’s crew fertilizes the Lake Oswego baskets once a week religiously with their very own Flower Power Fertilizer. It’s Lake Oswego inspired because of its low phosphorous content in an effort to reduce any phosphorous runoff into the lake. BUG CONTROL. According to Karsseboom, a bug worm can take a hanging basket from full bloom to green in a day or two. So make sure your baskets are protected with a low impact bug control. ENCOURAGEMENT. Everything grows better with a little encouragement, including Lake Oswego’s Village Flower Baskets. Karsseboom’s crew hits the streets to water and fertilize “under the cover of darkness,” but they are cheered on by passers-by and walkers. As for your baskets? What’s good enough for royalty, is good enough for us commoners. Prince Charles admitted to talking to his plants when interviewed about his gardening habits. So consider striking up a conversation with yours…under the cover of darkness of course! This entry was posted in Lake Oswego lifestyle and tagged Lake Oswego Oregon, Lake Oswego Village Flower Basket Program, The Garden Corner. Bookmark the permalink.